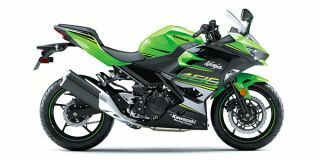 Kawasaki Ninja 400 price starts at Rs.4.99 lakh (Ex-Showroom, Delhi). The Kawasaki Ninja 400 is powered by a 399cc, liquid-cooled, parallel-twin motor that is mated to a six-speed gearbox. Peak power of 45PS is generated at 10,000rpm, with 37Nm of peak torque kicking in at 8,000rpm. The Kawasaki Ninja 400 is built around a trellis frame, similar to the Kawasaki Ninja H2. Like the Ninja H2, the new Kawasaki Ninja 400 also features a swingarm mounting plate, allowing the it to be affixed to the rear of the engine to improve stability. The front suspension is taken care of by telescopic forks, while the rear gets a monoshock. Braking is managed by a 310mm front dis c and a 220mm rear disc. Q. Which is best, Dominar or Ninja 400? Q. For the ninja 400 service. First one is 600 miles. When is the next service after the first one? Q. Can it be preferred for long journeys? Q. Ninja 400 or Benelli TNT300 which is good? Q. Is it suitable for me I am 6.4 ft?